Instuctors: Leon Rainbow, Will Kasso, Joe Base, Demer, Mek, Snow, Ras, Delve, Proze, Azma, Col, and Surprise Guests! 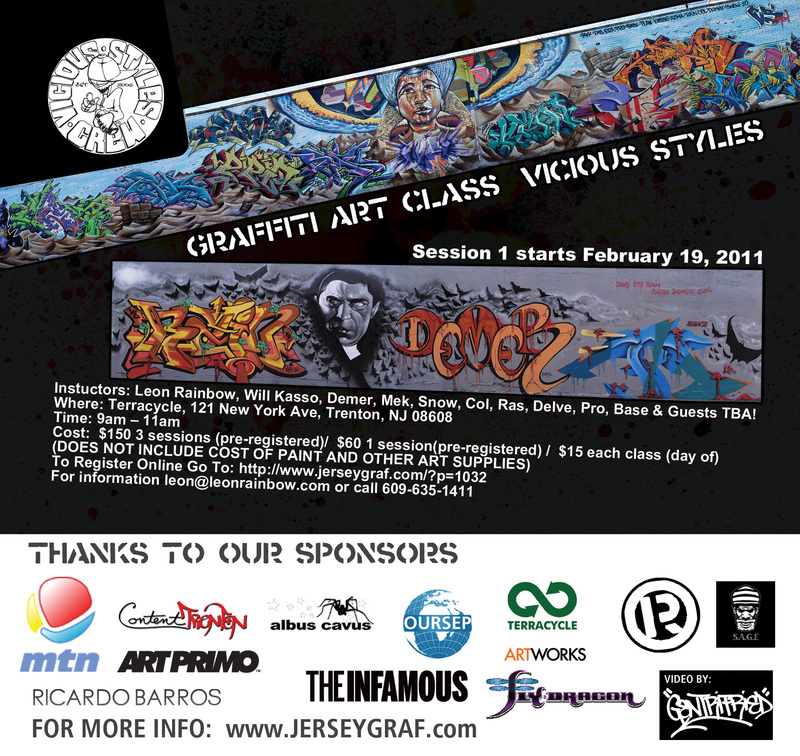 This session is an introductory lesson on graffiti writing. Within a 5-week course student will learn the basis of the history styles and traditions of Writhing. The Instructor guides the students on a virtual train ride on the past present and future of Graffiti writing. Through discussions, video, slide presentations and books students imaginations are colorfully sprayed with a rich experience… and enough inspiration to last a lifetime! Students 10-110 are welcome. No prior experience with Art graffiti is required. All students are required to come prepared with a black-book (sketch book) pencil, pen and a sharpie marker (black). Our goal and purpose it that you take this course to learn the basic foundation regarding graffiti. Understanding what “writing “ is really about and how it relates to you. This course is for students who wish to develop their lettering skills. During this session students experience intense black book sessions where they will learn color schemes, letter formations and style concepts, the second half of the session focuses on transforming black book sketches into actual burners. Can Urban Art be for sale? View thisfascinating clip from the hip hop documentary Style Wars, when graffiti artists were first invited into the “art world” http://www.youtube.com/watch?v=YNI2y-8gjR8 Can Urban Art be for sale? Can Urban art live in the gallery?